For more info on the world of Trowchester, click here, and to grab your copy of Trowchester Blues, click here. In all my Trowchester Blues books you can tell what the weather was like while I was writing, because it's the same weather the characters are living through. I wrote Trowchester Blues in the months before Christmas 2013. It's actually a speedily released book, but a year between writing and release is turning on a dime for a publishing company. As an author you have to do one or two more revisions to that finished first draft, sometimes more. Then you have to send the manuscript out to publishers. Then the editors at the publishing houses have to find time to read it. If they like it, I believe that it then goes out to other acquisition editors or something of the sort. They read it too, and if they like it, everyone gets together and decides to offer the author a contract. The first version of the cover didn't have the fantastic wrap-around picture that allows Finn to be on there as well, but once it did that meant another model I had to OK. But Finn was right on the first go. I like the logo, with the tea cup and the gun. I had some qualms about it, since Michael is an ex-cop in Britain, where our policemen do not carry guns as a general rule, and most of them aren't even trained in their use. There isn't actually a hand-gun in the book, but there's a hot farmer with a shotgun, and a not-so-hot arsonist with a rifle, so I felt the gun on the cover was true to the spirit of the thing, if not to the nitpicking pedantry. While the cover art is being done, there are also numerous rounds of edits. First you get a content edit, in which the editor is looking for big things like plot holes, continuity errors, characters with motivation that makes no sense, time lines that skip months because the author got too excited and rushed forward where angels fear to tread. Things you dread to hear at this stage are “I didn't feel there was much chemistry between the leads. Can you beef the romance up a bit?” But of course it's good to tackle that before it releases. Much better than let it go out and fall flat. After that edit, there are two or three rounds of copy editing, to try to catch all the typos, misplaced colons, comma splices, grammatical awkwardness and all those places where I've used the word 'little' fifteen times in the same paragraph. This is the point where hopefully someone will spot that Bert McGuyver spent three chapters under the name of Alf McGuiver and demand that he should settle on one name throughout. Once that's done, the cleaned up manuscript gets sent to a proof-reader, who will basically do the same thing again, only with a fresh pair of eyes, and mostly concentrating on the grammar rather than the story. So there's little surprise that with all of that to do, it can take a full year to go from finishing a novel to seeing it out in print, but it does mean that when it comes out, I get to relive those months. 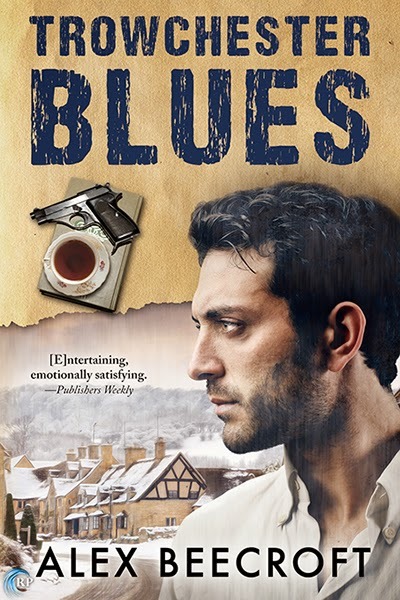 I was told recently that Trowchester Blues was a great book for comfort reading on a rainy day, and I think that's probably because I wrote it for comfort on a succession of rainy days from October to December 2013. I hope it brings you too the sensation of being indoors, wrapped in a blanket while the snow floats down outside the window, and you are safe and warm. Every comment on this blog tour enters you in a drawing for an e-book from Alex Beecroft's backlist (excepting Trowchester Blues). Entries close at midnight, Eastern time, on February 15. Contest is NOT restricted to U.S. entries. Looking better and better. I plan on reading this one. It is a great cover..I like the tones and the fonts! And I've read people say that writing is a piece of cake...Hah! Thanks for the interesting post. I learned some things about the publishing process. And, I think the cover turned out fantastic. I have Trowchester Blues on my TBR list. This is on my TBB list! Thank you for the chance at the giveaway! Thanks Trix! I love the cover too, and it's nice that the next two have a very similar layout - gives it a real series feel. Thank you Jen! I'm glad you enjoyed it :) And yes, a good publisher and a good editor will add so much to a book. I'm very thankful to mine. Thanks for being interested, Laurie! Sounds really great. Thank you for the post and giveaway chance!